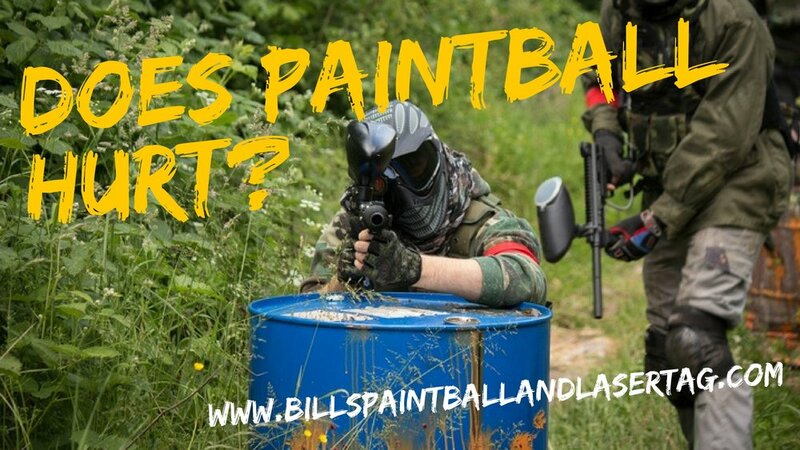 Do paintballs hurt? This is the number one question we get asked by just about everybody their first time out. So to give you a basic answer, yes, but not as bad as you might think. Don't let the fear of potential pain prevent you from playing a really fun game. Yes, you will get hit with a paintball and if it's on a sensitive part of your body or at high speed, close range, or on bare skin, it could hurt more but that's usually not the way it happens. By simply taking a few steps to protect yourself you could minor pain and injury. #1. Wear layers of clothing. This is not something to be played in a T-shirt or tank top and shorts. Make sure you have loose-fitting clothing and as many layers as the weather permits. Definitely have socks and shoes, longsleeved sweatshirts, a hoodie, and long pants but of course, you'll have a variety of options for clothing when you get here as well. We have different suits and chest plates to protect you and of course eyewear and neck protection. More: What Should I Wear for a Paintball Event? #2. Protect sensitive areas. The neck, hands, head, thighs and private areas are usually the most sensitive so you want to pad them with a little bit more protection and boys should even consider maybe wearing a cop if you're concerned. But again, it's not like you're going to be riddled with 100 paintballs, you may never actually even get hit. Direct shots hurt more than angled shots but that's, of course, difficult to control. #3. Follow the rules. By following the rules and listening to your instructor before you get out on the field will definitely benefit you. Not listening, breaking the rules, and going beyond the boundaries are bound to get you in trouble. #4. Make sure everyone understands a surrender rule. This is generally put in place to allow beginning players to understand the game without being bombarded right out of the gate. The surrender rule will allow players to surrender if an opponent has directly shot them within 10 to 15 feet. The opponent can yell surrender to let the player know that they can shoot them at close range and raise your hand to avoid being hit. It's always good sportsmanship to fire towards the foot or the ground when in close range to minimize any injury or pain. Inevitably, someone may come home with a slight red mark on their arm or leg but not enough to deter them from playing again. With the right protection, a little bit of preparation, and responsible rules, people can be a really fun activity for anyone.